"Significant quantities" of human remains have been discovered at the site of the former mother-and-baby home in Tuam, Co Galway. 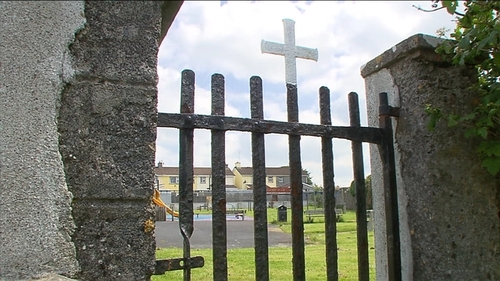 It comes after the Mother and Baby Homes Commission of Investigation began test excavations at the site of the children's burial ground on the Dublin Road housing estate in Tuam, Co Galway in October 2016. The commission was established following allegations about the deaths of 800 babies in Tuam over a number of decades and the manner in which they were buried. In a statement today, the commission said significant quantities of human remains have been discovered in at least 17 of the 20 underground chambers which were examined earlier this year. It added: "These remains involved a number of individuals with age-at-death ranges from approximately 35 foetal weeks to two-three years." The mother-and-baby home operated from 1925 to 1961; a number of the samples are likely to date from the 1950s, the commission said. Further scientific tests are being conducted. The commission said it was shocked by the discovery and is continuing its investigation into who was responsible for the disposal of human remains in this way. Meanwhile, the commission has asked that the relevant State authorities take responsibility for the appropriate treatment of the remains. Minister for Children and Youth Affairs Katherine Zappone said it was very sad and disturbing news. It was not unexpected as there were claims about human remains on the site over the last number of years. "Up to now we had rumours. Now we have confirmation that the remains are there, and that they date back to the time of the mother-and-baby home, which operated in Tuam from 1925 to 1961," Minister Zappone added. The minister said that we must respond sensitively and respectfully to the situation. She added that her department had brought together all of the key departments and agencies to set out a way forward. Today is about remembering and respecting the dignity of the children who lived their short lives in this home. "We will honour their memory and make sure that we take the right actions now to treat their remains appropriately," she added. Ms Zappone also indicated it was up to the coroner in north Galway and Galway County Council to decide if there should be further excavations of the site. She also said that Galway County Council would engage with local residents and those affected to decide what happens to the remains. In relation to excavations at the other 13 mother-and-baby homes that are being investigated, she said it was a matter for the commission of investigation, which is independent. Records previously show there were 796 children who died at the Tuam home when it was in operation. The woman who first raised concerns about the site said she is relieved at the confirmation that the remains of babies and children are buried at the site. Catherine Corless said "it is wonderful and emotional" that the truth has been revealed today. She said survivors of the former Bons Secours home for unmarried mothers should be consulted to see what they would like to happen to the remains. Speaking on RTÉ's News at One, Ms Corless said their one hope was that the truth would come out. She also said the Bon Secours sisters should apologise to them. Ms Corless said that during her research into the site "everything pointed" to this area being a mass grave, but despite this she was told to leave it alone. She said that it should have been properly investigated n the 1970s when the County Council, gardaí and the religious order knew what was there. Ms Corless said she believes the graveyard extends further overground where remains are buried in coffins. and the whole area needs to be investigated. "This is only the start," she said.